Edith McCain, age 89 of Malcom, died on Thursday, January 31, 2019 at Brooklyn Community Estates. A funeral service will be held at 10:30 a.m. on Wednesday, February 6, 2019 at the Smith Funeral Home in Grinnell with the Rev. Joyce Proctor, pastor of the Grace United Methodist Church in Brooklyn, officiating. Interment will be at Ivy Hill Cemetery in Malcom. A reception will follow at the Malcom American Legion. Visitation will begin at 2:00 p.m. on Tuesday at the Smith Funeral Home and the family will receive friends from 5:00 p.m. until 7:00 p.m. In lieu of flowers, memorials may be designated to the Edith McCain Memorial Fund to benefit local organizations, mailed in care of the Smith Funeral Home, PO Box 368, Grinnell, Iowa 50112. Edith May Bailey was born on March 12, 1929 in Grinnell, Iowa to Russell Lee Bailey and Alma (Heltzel) Bailey. She was raised on the family farm north of Grinnell in Chester Township and graduated from Grinnell High School with the class of 1947. Edith was united in marriage to Carol McCain on December 28, 1950 in Unionville, Missouri. The couple resided in Grinnell and later north of Malcom on the family farm. Edith worked at Clements Vet Clinic and later was a homemaker. She was a longtime member of the Newburg American Legion and 4H. Edith was an avid postmark collector and was a member of the US Postmark Club. She loved life on the farm and enjoyed tending to her garden and flowers. Edith will be remembered for the love of her family, her infectious laugh and humorous, fun-loving personality. 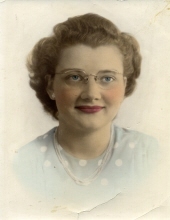 Edith is survived by her daughters, Carol Brown of Grinnell and Kathy (Ron Ellis) Kriegel of Brooklyn; son, Murlin (Susan) McCain of Malcom; 6 grandchildren, Julie McCain of Des Moines, Iowa, Jared McCain of Grinnell, James McCain of Farmer City, Illinois, Chelsea (Jason) Blattner of Hartwick, Iowa, Allen (Katie Hardeman) Kriegel of Brooklyn, and Beth Kriegel of Brooklyn; 5 great grandchildren; and her siblings, Richard Bailey and Virginia Durr, both of Grinnell. Edith was preceded in death by her parents; son-in-law, Ben Brown; and brothers, Perry and Charles Bailey. To send flowers or a remembrance gift to the family of Edith McCain, please visit our Tribute Store. "Email Address" would like to share the life celebration of Edith McCain. Click on the "link" to go to share a favorite memory or leave a condolence message for the family.